Valtteri Bottas (3rd, 1:28.124): "It's disappointing not to be in the first row. We've made some good progress through the weekend, but Ferrari was quicker today. We definitely have work to do at this type of circuits and in these kind of conditions. I think we have the right set-up of the car for the race, but it's difficult to estimate the race pace. I think it's going to be really closely matched between Ferrari, Red Bull and us, so it should be an interesting race. I learned a lot about tyre management last year at this track that I think I can use this year. We'll definitely go for it tomorrow and hopefully Lewis can also come back to get some good points so we can keep the pressure on Ferrari." Lewis Hamilton (4th, 1:28.220): "Today wasn't the best of days and tomorrow is going to be one of the hardest races for us in some time. We've been trying to get ahead of the Ferraris, but it has been tough, they just had the pace all weekend. It wasn't the greatest of laps from my side and Ferrari had the edge as they often do in these hotter conditions. The goal for tomorrow is damage limitation. I've got the Soft tyre, so I should be able to go longer - it's going to be interesting to see, there's a couple of different strategies tomorrow. I'll try and eke out every last bit of power and strength from this car. I don't know what we are going to be able to achieve tomorrow, but I will give it everything I've got and hope that I can do something." James Allison, Technical Director: "Although we made a small step forward relative to our performance yesterday, we were disappointed to learn this afternoon that it was not enough to compete on level terms with Ferrari. However, we know from Friday's long runs in practice that we have good tyre degradation, and there is every reason to expect a close race tomorrow, especially for Valtteri who will start from the clean side of the grid. With Lewis, we will need to be quite imaginative with the strategy to allow him to recover from the gearbox penalty - but this is a circuit where overtaking is possible, although never easy, and which will offer opportunities to make progress by starting on the soft compound." Toto Wolff: "This was a difficult qualifying session for us but about what we expected after practice yesterday and today. Ferrari have always been strong in the hot conditions and they confirmed that with their one-two in qualifying, with pace that was just out of reach for both Valtteri and Lewis. We have said through the winter that the performance between the top teams is very close and this result simply confirmed it. Like always, we need to keep our feet on the ground, stay humble and keep working. The long runs in practice were very close between Ferrari, Red Bull and ourselves, so there is still much to play for tomorrow. But it's clear from today that Ferrari will start as favourites." Daniel Ricciardo (5th, 1:28.398): "That was really close. Part of me is disappointed that we are so close but still at the tail of the lead pack in Qualifying, but I don't think I could really have done much better. Lewis was still a couple of tenths ahead of me. There was maybe a tenth left on the table but I think the Mercedes still had some extra pace. It's almost frustrating to be so close but actually it's encouraging that the top five cars are within about four tenths. I'm always excited for the race. Practice and Qualifying are ok but Sunday is my favourite day of the week. Yesterday our race pace didn't look bad but I think our car in FP2 wasn't as good as it is now, so it's encouraging to know that our car should be even better tomorrow and hopefully it puts us in the fight. We will start in fourth place now with Lewis's penalty so I think it is going to be exciting. Hopefully, in 24 hours we can do a pretty cool interview after a good race. I'm also pleased for Pierre, Toro Rosso and Honda today. Not taking anything away from Pierre, but in my first year at Toro Rosso I also qualified sixth here and he has done the same. I can see him doing the interviews and he is super excited, so it's good for the team and I'm happy for him." Max Verstappen (15th, No Time): "I was very surprised at what happened in Q1 so I wanted to try and understand the cause before commenting on it. What we can see in the data is a sudden power increase, just like an on/off switch. It looks like roughly 150 Horse Power was suddenly switched on during the corner which of course is not easy to anticipate, this caught me out and meant I lost the rear and spun. The damage to the car was just the front left corner so we don't have any major concerns for tomorrow. I was disappointed to crash not just because it ruined Qualifying but also as the car is looking very quick here so has made the job tomorrow hard. At least at this track you can overtake. My race pace looks good so if I can have a clean first stint and get past a lot of cars it could still be an exciting race. You always need a bit of luck so a safety car to bunch up the field would help and make the race open again. We have a quick car so that is always good, let's see what I can do tomorrow." Christian Horner, Sporting Director: "After a Qualifying session with plenty of action, it's interesting to see the top five cars qualify within four tenths of each other. Daniel got the best out of the car today to finish in fifth, which will become fourth on the grid with the penalty for Lewis. Max who was doing another lap in Q1 gathering information on engine settings unfortunately lost the rear, the reasons for which we will have to look at, but frustratingly it ended his Qualifying early. However, the damage is superficial and hopefully from 15th on the grid he will put his head down and make some progress through the field as our race pace has looked encouraging here. It is set up to be an exciting race tomorrow." Esteban Ocon (9th, 1:29.874): "I'm feeling pretty pleased with our performance tonight. We are back in Q3 after a huge effort by the team over the last two weeks. We did a huge amount of work yesterday – testing, learning and understanding things on the car – and we can already see the improvement compared to Melbourne. It's a good sign for the future and it shows the strength of this team even when we are under pressure. The car felt strong tonight and I think we are in good shape for tomorrow. Points are the target and we have good straight-line speed and decent race pace." Sergio Perez (12th, 1:30.156): "I am happy with what we achieved today. We made some good progress and we turned out to be closer to the front of the midfield than I thought we would be. I missed out on making Q3 by a very small margin, but it's not too bad to be starting from P12. Grid position is not as important here as in other places so there is still plenty to fight for tomorrow. I think we can score some points and it's definitely a big opportunity for us. It's going to be a long race and I think tyre management will be very important so hopefully that will play to our advantage." Otmar Szafnauer, Chief Operating Officer: "It has been a very intense couple of weeks working behind the scenes since Melbourne to understand the car better and make improvements. Tonight's results suggest we are moving in the right direction with both drivers showing competitive pace in the very close midfield battle. We are traditionally stronger in racing conditions and with Esteban starting from P8 and Checo in P12, we have a good opportunity to score points tomorrow." Sergey Sirotkin (18th, 1:31.414): "I think we could have hoped for a bit more. The first lap I did was a really good lap. I don't think we could squeeze out any more from there. The second lap with the second set of tyres was strongly affected by a very messy outlap where I was fighting three or four cars for position. It was really messy preparation, I started the lap just behind a Sauber, and even then I knew the tyres and the brakes were not there. I almost managed to beat my previous lap-time, which shows we could potentially go another three or four tenths quicker, but I don't know if that would have moved us any further ahead. I think, compared to Melbourne, we actually did a better job, in some terms we maximised the performance of the car. We are moving ahead in one area, but we are missing something. I'm happy because we're moving ahead and we are not making the same mistakes as we were in Melbourne. We didn't see it in the results, but for sure the way we are working is better and personally I'm happy with that." Lance Stroll (20th, 1:31.503): "It has been a really hard weekend. It was disappointing for the team with both cars out in Q1 and it was not ideal. A lot of things are wrong. The balance isn't there, the grip is not high enough and we need more speed, so we need everything to go quicker. Last year in qualifying, my lap was four tenths better than it was today. In the race, I hope we can go forward, but we don't have the package today to compete where we want to compete." Paddy Lowe, Chief Technical Officer: "That's not where we want to be starting the race but we weren't quick enough today for a number of reasons, some of them we understand, some of them we don't. We need to go away and do some more work. The race will be difficult from these grid positions but as always we'll do our very best as a team to see what we can achieve tomorrow." Nico Hulkenberg (8th, 1:29.570): "I would prefer to be fifth, but in Q3 things seemed to slip from our hands a little. My Q2 lap was wonderful, it was as good as it was going to get, but in Q3 it didn't feel quite there. I couldn't repeat the lap time otherwise we'd be in fifth. I think we'll start seventh and we have every chance for a good result from there tomorrow. Our race-pace was similar to our rivals, but our target is to beat them." 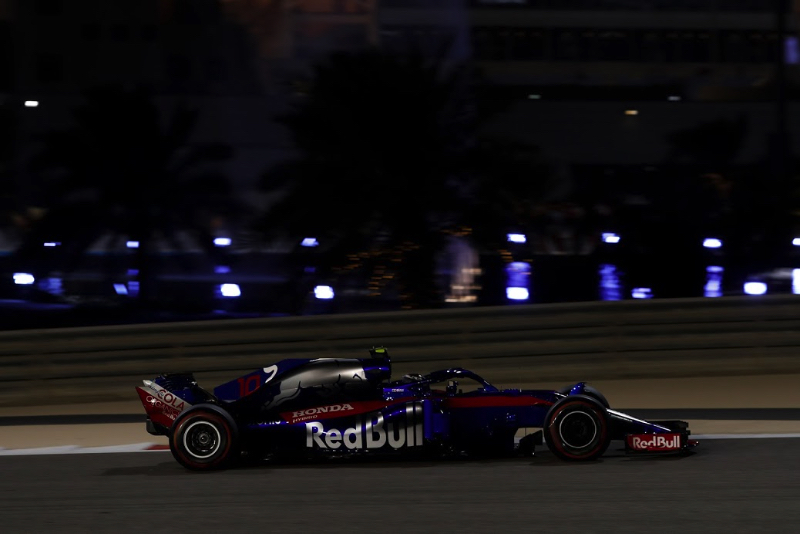 Carlos Sainz (10th, 1:29.986): "I've been chasing car balance the whole weekend and I wasn't fully comfortable with the car during qualifying, finding it difficult to put a perfect lap together tonight. However, I've been happier with the long runs and there are a lot more possibilities during the race, especially with the tyre degradation that we've seen at the moment. That opens up a lot more windows so we'll be ready for it. I'm convinced we can move up the grid tomorrow and have a good one." Alan Permane, Sporting Director: "We're looking at the strategic options... It was relatively straightforward up until Q3, however we weren't able to extract the expected pace improvement in the final session so that's something we're looking at. Overall, the R.S.18 is working very well for the second race running and we're learning more about it every time. We're happy with our long-run pace from Friday and it will be a different race to Melbourne in terms of tyre degradation, which will be a lot higher here. We're looking at the strategic options." Pierre Gasly (6th, 1:29.329): "My best qualifying in Formula 1! It's been an amazing day…the team has been working very hard since the beginning of the weekend and it's good to see this effort repaid. I felt really good in the car so I'm very happy. Since the first lap in FP1 I felt we were pretty fast, but we knew we had to put everything together to get into Q3 and we made it! It's pretty mega! Hopefully I can get the best start possible tomorrow - we saw in FP2 that our long run pace was good so let's see! Of course we expect the front runners like Hamilton and Verstappen to come back quickly, but I think we will be in the fight with Renault and Haas hopefully, so we need to work really hard tonight and make sure we have a car as fast as today and aim to score good points in the race." Brendon Hartley (11th, 1:30.105): "There's a bit of déjà vu from Melbourne, I just missed out on Q2 there, and in Bahrain I just missed out on Q3! We've definitely taken a step in the right direction as yesterday we were really on the back foot from our side of the garage. The team brought an update here which was actually worth a large amount of time. It's an amazing job from Toro Rosso to bring so much performance from the aero side to the track. I only got the new package for the first time today so I was a bit behind the eight ball but, at the end, I was very close to Q3 that I have to be happy anyway - I think everyone's done a great job. Unfortunately, I used three sets of tyres in the first part of qualifying – with hitting the bird and breaking my front wing. I don't know how the bird is, but my front wing was destroyed! It was really close today…it's a shame I made a small mistake on the last corner!" James Key, Technical Director: "We came to this event after quite a bit of work since the race in Australia on chassis setup and quite a lot of new aero developments, both of these seem to have worked well and given the steps in performance we hoped for. We ran the aero package and chassis setup items with Pierre on Friday and got some useful data and feedback, moving Brendon to the same approach today which had a similarly positive effect. It's good to see we're back on track compared to the first race and closer to where we want to be, we have a better basis to move forwards from now. I'd like to congratulate Pierre for his first Q3 – he did a fantastic job today - he's been comfortable with the car all weekend and this translated to a strong performance this evening. It is a very tight field right now so to put the laps together like he did was a great effort from him. Similarly, well done to Brendon for a good performance today, it's a shame he missed out by less than a tenth to get into Q3; he only had one run on new tyres in Q2 and unfortunately it was just shy of the time needed to get through, but nonetheless he's made really good progress today and I think we start tomorrow in a good position with both cars." Toyoharu Tanabe, Honda F1 Technical Director: "A strong performance from both drivers, with Pierre getting into Q3 and Brendon just missing out on the top ten by a tiny margin. The changes made to the aero package have certainly worked and this circuit seems to suit us better than Melbourne. All the sessions so far have gone smoothly from our side and that always helps. Today's performance is a nice boost for the team – well done to everyone -and now we will ensure we are as well prepared as possible for tomorrow night's race." Kevin Magnussen (7th, 1:29.358): "It went well and I'm very happy with today. The tires here have been really difficult to switch on. You either don't switch them on or you overheat them. It's a very narrow window. To get that sorted for qualifying and find a good rhythm all the way through the session consistently – it felt good. I'm happy. It's a little bit annoying to see one car ahead by one-, two-hundredths of a second. You could always find a little more, but then so could they. I think we got everything out of it today. Our race pace still isn't a given, but it's looking good. It wasn't bad on Friday, so we're positive, but we're also aware those tires are pretty tricky, so we need to get them in the window, then we'll be fine." Romain Grosjean (16th, 1:30.530): "I don't really know what happened. We had a very difficult out lap with a lot of traffic and just no grip. There's not much to say except that I had very little grip and couldn't do any better. We need to understand that, but I'm disappointed. We made a lot of changes last night, so I'm hoping that will pay off for our race pace tomorrow." Guenther Steiner, Team Principal: "It wasn't a great qualifying, but it was still a good one. We have proven again that the car is fast. Unfortunately – and it could only be us – that you miss Q2 with the same time to the guy that finished 15th. That bad luck will end, but we also need not to blame it on only being unlucky. Romain had a little bit of traffic, and he didn't get his tires to work on his out lap in that traffic. I think we're still in a strong position to score points with both cars tomorrow. After not a perfect run up to qualifying, we go away finishing seventh and starting sixth due to Hamilton's penalty. I'm looking forward to tomorrow to get points." Fernando Alonso (13th, 1:30.212): "Today wasn't great – our qualifying performance was worse than we expected. It was okay in free practice, but then in qualifying we lost speed and we were struggling from Q1. Our one-lap performance is not yet optimised – we cannot extract the maximum from the tyres over one lap, and we need to find the reasons why. Our race pace has been better than our pace over a single lap so far, and yesterday during the long runs on old tyres we felt quite competitive. This morning, too, on a hot track the car felt good and we seem to take good care of the rear tyres, which is going to be an advantage in the race. But, obviously our starting position is compromised already and we are quite far back, so we'll see what we can do. Having said that, not making it into Q3 isn't the end of the world. We didn't make it there in Australia either, but on Sunday we both scored points, so hopefully we can repeat that here. This is a demanding circuit, tyre degradation is high and reliability is a concern, so we need to stay focussed and take advantage of the strategy. The free choice of tyres now gives us some advantage and we'll try to maximise that. The race is tomorrow and that's when the points are given." Stoffel Vandoorne (14th, 1:30.525): "We all expected a bit more from today. We had good sessions yesterday in FP1 and FP2 and I was feeling very confident in the car. We know we're in this very compact midfield where every tenth is very important for us and makes all the difference, so we need to keep improving. With a step forward today we could have fought for Q3, but we knew it was going to be tough. In these harsh conditions things can change quickly and it's really unfortunate we couldn't get there. We didn't make the step forward that we needed to today, so we need to keep pushing and there's a lot of work to do. But, I think we can race tomorrow. We had good pace during the long runs on Friday and the balance was pretty good. This is a circuit where strategy and tyres are quite complex, so there are some possibilities. We need to be opportunistic and, like in Melbourne, try to benefit from other people's mistakes. We have a free choice of tyres tomorrow, and I think around here it could be quite interesting. Tyre degradation has been key at this track in the past and there are a number of different strategies possible. We've seen some good races here and that's what we're going after tomorrow." Eric Boullier, Racing Director: "Although qualifying was the tough challenge that we predicted in what is an extremely tight midfield pack, our performance today was certainly below our expectations. Both drivers didn't feel as comfortable or confident in the car as they were yesterday, which is something we need to analyse overnight with our engineers. We recognise that the teams around us often make a performance step on Saturday and this is something we must address. However, we know that the race pace of our package tends to be more positive than our speed over one lap, and with a free choice of tyres we believe we can fight for points on Sunday. Now, we'll work hard to analyse all the data from today and put everything we can into setting up the cars, so that we can move further up the field in tomorrow' race." Marcus Ericsson (17th, 1:31.063): "Today we decided with the team to focus more on the race preparation and FP3 was a really good session; we were really in the fight here. In qualifying as well, we were fighting in the midfield. Unfortunately, we weren't able to make that extra step up towards the end of Q1 as our competitors did. It's a bit disappointing to be out in Q1 because it felt like Q2 may have been possible – but at the end, it feels good to see that we are making progress. We worked a lot on race set-up and I am expecting us to be fighting in the midfield during the race tomorrow, so let's see what is possible." Charles Leclerc (19th, 1:31.420): "We had a good Friday, but today was a little bit more tricky. The balance of the car was not quite how I wanted it to be, but I think that I still have some work to do in adapting to this type of car. In particular, I have to learn how to drive with more understeer, which I am struggling with a bit at the moment. In the end it was a bit frustrating, but I will definitely learn from this experience and I will do my best to come back stronger in tomorrow's race. The pace we showed yesterday is promising, so it will be important to make a good start and to recover positions."